Fellow fishermen and women reading this are quite familiar with the annual ritual of purchasing a fishing license. Be it a bait shop or sporting goods of a department store, a glass counter houses fishing reels, rifle scopes, and knives. Like entering a favorite restaurant, eyes fix on a menu. Choices here include one-, three-, or five-year options. The special the Pennsylvania Fish & Boat Commission (PFBC) is serving up, a snappy button to replace having to display the actual license. Anglers must still have their license in possession – in one of their vest’s 43 pockets. Now that the main course has been determined, it’s time for sides. I’m certain I’ll trek the streams a couple of days during trout season. Will I make it up to Erie in the fall? “No problem,” the worker diligently answered. With the simple swipe of my driver’s license, my transaction was practically complete. I opted for the 1-Year Resident with a 1-Year Combination Trout/Salmon Lake Erie Permit. Now for my son. I explained this gift idea would be my boy’s first license. “Noah Nych,” I quickly answered. I grinned, “I think he’ll be under my roof for a few more years.” At that, the man saved time by using the address from my fishing license. I had read the Voluntary Youth Fishing License, at a mere $2.70, nearly doubled as an investment in our PFBC. The commission receives $5 back in funding as a federal reimbursement. To me, supporting such a worthy cause was a no-brainer. Noah’s license, stamped with a height of 1’8”, will undoubtedly became a cherished keepsake. Rocking my boy in our family den, Noah tends to gaze up at the walleye valiantly gliding through the current along the northeast corner of the room. My mind can’t help but stray to Noah and the great angling adventures he will seek along one of life’s many cycles – that experienced by a fisherman. No ingredient is more crucial to the uniquely wondrous recipe of childhood than fishing. Shortly after Noah learns to fish, he will likely pick up walking. I will gladly adorn his Pittsburgh Pirates hat with a Pennsylvania fishing license and his tackle box with enough lures to keep at bay the snags haunting a budding angler. During such formative, impressionable years, I will encourage my son to wet a line with a colorful cast of family, friends, and neighborhood kids. These boyhood experiences, even the fishless days, will shape the man he will become. Like a trusted teacher, angling will lead lessons on humility, perseverance, and patience. Coincidentally, the first year Noah will legally necessitate a fishing license in Pennsylvania will be the very year he’ll parallel park his way to a driver’s license. Two momentous occasions within the same calendar. It will be a good year indeed. Similar to the way I filled the trays of my son’s tackle box with “Daddy’s go-to lures”, so too will I keep his gas tank full for he and his fishing buddies. So long as they fill their days with fish and memories, it will be the least I could do. Once 16, for the first time Noah’s fishing trips with buddies will outnumber outings with Dad. And that’s okay. This beautiful, yet short cycle will complete its revolution when my dear Noah finds himself standing at a glass counter. After boasting to the bait shop owner not of fish but of his family, Noah will take his newly licensed, little fishing buddy to a farm pond. While waiting for a bite, Noah will tell the child of his first fishing trips. Interruption comes in the form of a taut line, bent rod, and arched smile. The youthful angler frantically fights the fish. A memory is seared along the origins of yet another cycle. The words of the story have yet to dry as the child brings this first fish to hand. Noah removes it from the hook and hands it to the fine fisher. 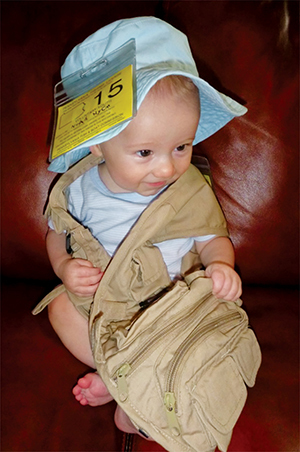 Perched atop PFD’s, one of our commonwealth’s youngest anglers brushes up on 2015 rules & regulations….